Hi everybody! I’m glad to be back in my writing activity since the past two weeks has been crazy! But even if my family got hit by a tremendous stomach bug, I didn’t stop cooking, and one specialty I made during these past days has been Gnocchi. “Gnocchi” (pronounced: NYOH-kee) are similar to what Americans call “dumplings.” They are an ancient food which can be prepared with different kinds of starch: wheat flour, rice flour, potatoes, dry bread, potatoes or vegetables. In Italy, the most common gnocchi prepared today are made with potatoes, but also widespread are those prepared by a simple mixture of flour and water. Others are prepared with semolina, like the Gnocchi alla Romana. Still others are prepared using cornmeal or various other ingredients which vary with regional tradition. You can also find colorful gnocchi thanks to the use of ingredients which lend their various colors. For example, “Zanzarelli” green are mixed with beet and spinach, and “Zanzarelli” yellow are made with the addition of pumpkin or saffron. More are whte “Malfatti” when they’re mixed with minced chicken meat, or orange when they are prepared with carrots. It is funny to observe that different Italian regions have a special day for Gnocchi in their tradition. For example, Lazio (the region around Rome) has “Gnocchi Thursday” (Giovedi’ Gnocchi). In Campania (the Naples region), Gnocchi are the typical dish of Sundays. In Verona (the city of Romeo and Juliet), Gnocchi are instead more typically a Friday meal (Venerdi’ Gnoccolar). In my family, Gnocchi has always been the special meal of Sundays, and the Gnocchi recipe my great-grandmother taught me is the simple one made with potatoes. It is a frugal dish, absolutely delicious, and most of the time, loved by everybody without age distinction. What you will need to prepare these Gnocchi are just a few ingredients: potatoes, eggs, flour, and the sauce in which you prefer to dress them. Considering that you need boiled potatoes, to make Gnocchi it takes about one hour to cook the potatoes, five minutes to mix the ingredients, ten minutes to obtain the little gnocchi and few more minutes to cook them. About 90 minutes in total. Boil the potatoes in their skins (normally it will take about an hour). It is important not to cook them too much ’cause if they break in the pot, they’ll absorb the water which can ruin the texture of the dough. When the mixture is combined enough to stick together, turn it out onto a floured surface and knead until you get a smooth texture. Have the foresight not to knead the dough too much; kneading too long leads to Gnocchi which are too soft. Being careful to keep the work surface floured, form a loaf, cut into slices, then roll each slice into long, thin rolls about 1 inch wide. Cut the rolls into 1/2 inch long pieces, and then create streaks by rolling the dough over the tines of a fork. This is not only for an aesthetic reason, but also because the Gnocchi will better absorb the sauce this way. While you are preparing the gnocchi, put a big pot of salted water on the stove to boil. Once the water is boiling, cook the gnocchi by dropping them in the water a few at a time, cooking in small batches so they will not stick together. I would suggest cooking about 20-25 Gnocchi at a time. You will know they are cooked when they become afloat. They will come to the surface of the water within a couple of minutes. Take them out of the water with a slotted spoon as they come to the surface, and continue cooking the other Gnocchi. Remember to keep the heat high enough to keep the water always boiling. Once all the Gnocchi are cooked, drain them thoroughly- until the surface is no longer shiny. Then dress them with the sauce of your choice and parmesan cheese. Be careful not to stir them too much or the texture will become mushy. Serve still warm. – Since you have to cook the Gnocchi in multiple small batches, to keep those already cooked warm, I usually dress each batch with the sauce and parmesan as soon as they have dried. Each time, I put the newest batch of drained gnocchi over the ones already dressed, dress that batch as well, and so on. – You can easily freeze Gnocchi when they are still uncooked. 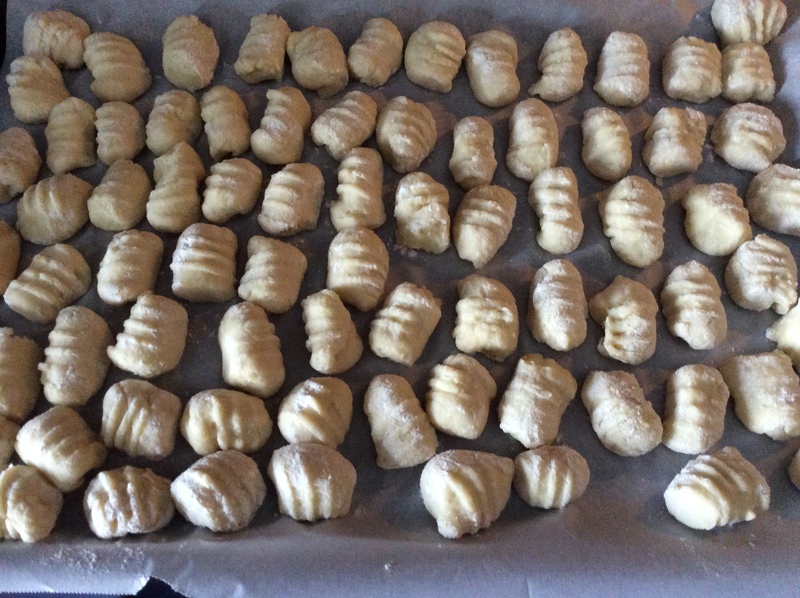 Just put the gnocchi on a baking sheet, well-separated from each other, and freeze them. After a couple of hours, when they are frozen, take them from the baking sheet and put them into a bag, and keep them in the freezer until you are ready to cook. When you need to use them, cook without thawing. 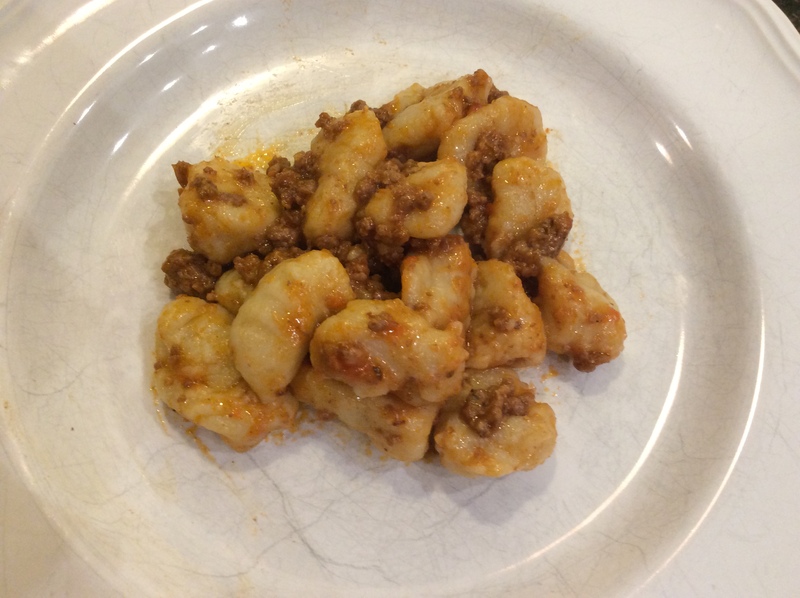 – As you can guess from the last picture of this post, my favorite Gnocchi dressing is Ragu’ sauce, but I know that many people love them dressed with tomato sauce or melted blue cheese. Parmesan, however, is not an option; to get the best taste from Gnocchi, you should use the original Italian Parmesan! I really hope you like this recipe, and please, if you do, share it, like it, and support my blog! < Amaretti and Rum Tiramisu: a “RESTRICTED” dessert!